Mechanics sure know their meze. Long and dirty days loosening bolts, changing burnt oil, swapping air filters and suspiciously eyeing malfunctioning carburators must open their appetites. I picture a handful of them after work, grime under their fingernails and their overalls smelling of exhaust gas, hunched like giants over a table crowded with enough food to feed a pod of walruses and reenergise them for a new day at work. It hardly surprised me then when My Alternate Personal Skipper (MAPS) told me that a mechanic he works with introduced him to "To Koultouriariko," an inconspicuous tavern on a tight bend in the village of Gourri. On a side note, Gourri takes the prize for "Most Unpleasant Village *Name* on The Rock," one that, in The Wife, Ph.D.'s sophisticated opinion, recalls swine and slime. The tavern occupies a small traditional corner house with a medium-sized veranda for outdoor seating. The decor is sparse, and the patrons are packed tightly into two rooms, leaving little space but in your belly for the copious amounts of food that's rushed to the table. So there we sat, myself, Little Miss Despot, The Wife, Ph.D., Double Trouble, The Brother-in-Law, Radio Free Cyprus and Cousin #2, hostages to MAPS and Cousin #6's invitation to be handsomely fed. Please bare with me as I walk you through our meze that Sunday afternoon. [WARNING: Long list in the making.] A traditional and very fresh village salad, feta and all. Green crushed (not crashed, people) olives with coriander and lemon. Tahini dip. Thick village yoghurt. Pickled green chilli peppers and actual pickles. Slices of white bread, both untouched and toasted with olive oil and herbs. Wine-soaked sausages, not as good as Katidata's but still rather tasty. Grilled halloumi, duh. The house specialty and main reason behind our visit, a pastitsio served in a medium-sized terracotta ramekin, piping hot and creamy and nuanced and the best I've had, exclamation point. Runny scrambled eggs with fresh tomatoes. Lemony stuffed vine leaves. More scrambled eggs, this time with spinach. Snails tossed in a sweet and cinnamon-infused tomato sauce. Wine-soaked bacon. Crunchy pork souvlakia. Pitta bread. Tender, juicy, herb-packed sheftalies, again (there's an ongoing theme here) the best I've had in years. Lamb (not lamp, people) chops. Lamb liver and sweetbreads. Bulgur wheat and keftedes, these (their only misstep) too packed, dry and cold for my taste. Moist chicken souvlakia marinated (according to Radio Free Cyprus) with onions, garlic, paprika and yoghurt. Hand cut potato chips sprinkled with oregano. Lamb souvla that fell off the bone, an extra dish custom-ordered by MAPS because, hey, we all need our veggies. A sweet ricotta-filled fritter topped with confectionary sugar for dessert, although MAPS assured us their pitta tis satzis, a grilled pitta layered with honey and sugar that was unavailable that day, is [insert the sound you associate with your mind being blown into a thousand pieces.] 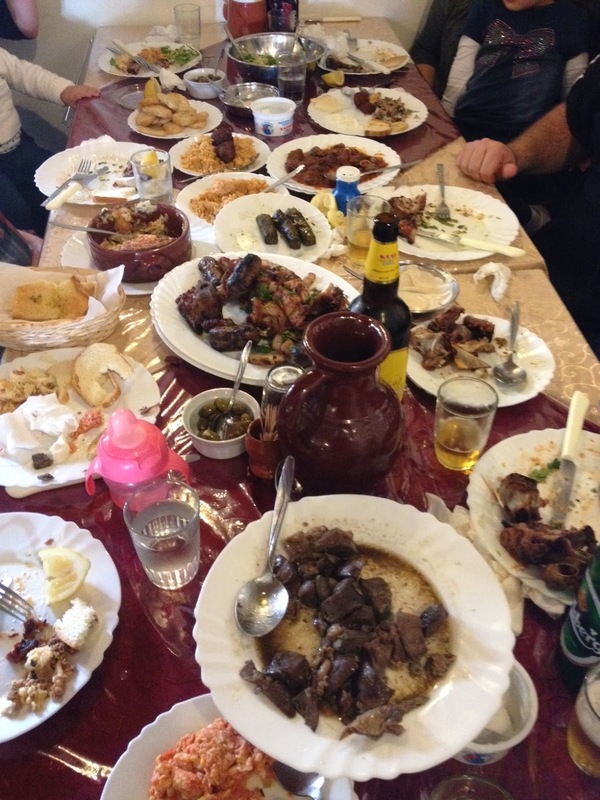 All washed down with a few Coke Zeros, gallons of water, a few bottles of Carlsberg and KEO, and Cypriot coffee. Final tally: twenty-four dishes, 22.50 Euros per round booty and one of the best tavern experiences I've had on The Rock. So, friendly suggestion. Next time you get your car serviced, chat up your mechanic and give him a heartfelt hug; he might tip you off to some hidden, delicious eats. #HugYourMechanic. Good Greek mezes aren't that easy to find strangely enough. So, thanks for sharing this place and experience. Cypriot mese is the best taste experience I've ever had! Surprisingly, the portions of the supposedly “small dishes” are actually huge! You can easily get a good taste of all foods you like. I'm sure that one meze selection can show all the diversity of Cypriot cuisine, don't you think so?